With regard to oil, the G8 leaders agreed to improve the balance between supply and demand — through a dialogue between oil producing and consuming countries — with the aim of improving transparency. Just exactly what form of dialogue and how exactly to ensure transparency is not clear. Perhaps establishing some kind of independent audit body or expert group to work with the producers to verify the extent of existing oil reserves would be an important first step. However, this is both politically contentious and difficult to implement and hence not the sort of recommendation to come out of a G8 Summit. Instead, the G8 leaders emphasize the need for increased production and refining capacities, as well as expanded investment on the supply side. So this is the business as usual scenario. The importance of improving energy efficiency is mentioned in the Chair’s statement, as well as the need to pursue energy diversification on the demand side, but this appears secondary to increasing supply when it likely should be the other way around. Japan did, however, offer to host a forum on energy efficiency and new technologies, and let’s hope that emphasis is placed on the huge numbers of new jobs that can be created as a result of investments in these areas. There will also be a meeting in London that follows up discussions at June’s energy summit in Jeddah. Hopefully we will soon start to see, as promised by the G8, detailed analysis emerging on the real and financial factors behind the recent surge in oil and commodity prices, because so far we have seen very little. Better analysis would ideally allow and encourage relevant national authorities and international organizations to take more initiative and go beyond simply asking OPEC to increase production. The food crisis is described as multifaceted and structural. The initial response from the G8 has been to commit an emergency package of over US$10 billion, and other donors are called upon to rally around and enhance these commitments. A G8 expert group has been tasked with monitoring of the implementation of commitments and will liaise closely with the High Level Task Force on the Global Food Crisis led by the UN Secretary General. Perhaps most significantly, on climate change, Fukuda indicated that there was consensus on the goal of achieving at least 50% reduction of global emissions by 2050. The achievement of this goal, however, relies on contributions from all major economies (including Brazil, India and China). The main objective is to move toward an agreement in Copenhagen in 2009, on the shape of the post-2012 climate regime. So there is now growing recognition amongst the world’s leaders that we need a mix of target-setting and technological and social innovations that could go hand-in-hand to bring about the rapid shift to a low carbon world. This is reinforced by the agreement from the G8 leaders to establish an international initiative to develop roadmaps for innovative technologies and the commitment of US$10 billion annually to research and development (R&D) on these technologies. While a very positive development, we should recall that studies by the International Energy Agency have shown that in order to achieve “50% reduction, the additional total investment required over the period to 2050 is around US$1.1 trillion per year, which is roughly equivalent to the current GDP of Canada. It represents an average of some 1.1% of global GDP each year from now until 2050.” (report available for download). Moreover, the one of the clearest signals to come from the Summit may well be that the G8 no longer has the central role that they had in the past. 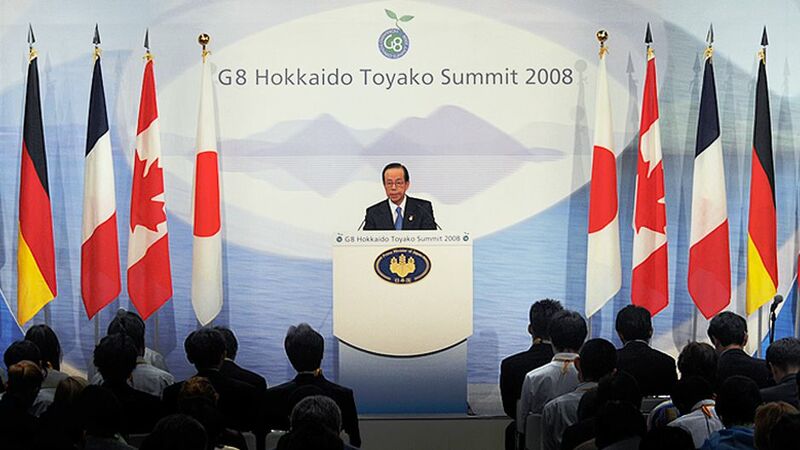 Rather, the Toyako Summit was actually much bigger than the G8 and through the outreach sessions brought together seven African countries as well as Brazil, China, India, Mexico, Indonesia, Australia and the Republic of Korea. Cooperation from these nations is essential when tackling global problems related food, fuel and climate change. Outcome from the Toyako Summit by Brendan Barrett is licensed under a Creative Commons Attribution-NonCommercial 3.0 Unported License. Do Global Summits Help to Tackle Poverty?